With a formal degree in Textile Designing and pattern cutting with a French Instructor, combined with an inherent sense of aesthetics, Anjana established Studio A, a design studio in New Delhi. She launched her first collection at a fashion show in 1994 with Bina Ramani, one of India's leading designers and pioneer of the Indian fashion industry. This was soon followed by a solo fashion show An Indian Summer, which was held at the prestigious UNESCO Hall in Paris. Since then, Anjana has had several showings in Sharjah, London, Kathmandu, New York and Germany, along with showings of her collections in Delhi. The Anjana Bhargav label reflects silhouettes where each collection has an inspiration, with accessories on garments as her hallmark. Her designs resurrect patterns and skills of ancient arts into the rhythm of modern life, keeping the accent always on comfort, wearability and affordabifity. The penchant is always on minimalistic styles that extend easy wearability and understated elegance. Not merely celebrities, but individuals who have achieved substantial innings on life's path like Arundhati Roy (Author and Booker prize recipient), Shahnaz Hussain (Queen of India's Beauty Industry), Ms. Sushma Seth (character actress), Sharon Lowen, Shovana Narayan (Kathak danseuse and Padamshree recipient), Kaushalya Reddy, Shivani Wazir, Dr. Kiran Bedi (Award winning police officer), Shubha Mudgal (classical vocalist and Padamshree recipient), Romy Dev, Feroz Gujral, Femina Miss India Asia Pacific Divya Chauhan, leading New York model and Uruguan Ambassador's wife, Tini de Bucourt de Anchordoqui, have also been seen adorning the Anjana Bhargav label. Anjana has been actively designing for the Usha International group of companies. Usha International has the largest network of Usha sewing schools across the country. 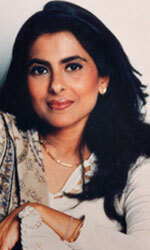 She has been commissioned to upgrade and develop the curriculum for the Usha International Fashion Institute. Anjana designed and fabricated jackets for the prestigious PATA Conference for Delhi Tourism held in April' 2002 in New Delhi. Anjana has also made a mark in the corporate sector by designing and fabricating uniforms for Hotel Grand Intercontinental, New Delhi and the ITC Group of hotels across the country.